Pryor recently worked out for the Lions, a source told Ian Rapoport of NFL Network. The Bills released Pryor on Tuesday, Adam Schefter of ESPN reports. Pryor failed to record a reception on his three targets in Sunday's win over the Jets. Analysis: Pryor was nowhere to be found against his former team, logging only 31 offensive snaps (42 percent) after leading Bills wideouts in reps just a week prior. Given the inconsistency of his snap counts, Pryor won't attract much fantasy attention once the Bills return from their bye next week. Pryor started and played 75 of a possible 91 offensive snaps (82 percent) in Sunday's 41-9 loss to the Bears, finishing with two receptions for 17 yards on five targets while losing a yard on his lone carry. Analysis: This is a solid baseline for what can be expected from Pryor moving forward with his new team, as the lack of talent around him should keep Pryor involved while simultaneously limiting his production. Anyone counting on the big-bodied wide receiver in a revenge game against the Jets in Week 10 will be pinning their hopes on a touchdown, as Buffalo couldn't get a single receiver over 40 yards in this one. Pryor, signed by the Bills on Tuesday, is not among the team's inactives for Sunday's game against the Bears. Pryor (groin) believes he was underutilized during his time with the Jets and expects to have a larger role in Buffalo, Mike Rodak of ESPN.com reports. The Bills signed Pryor (groin) on Tuesday, Chris Brown of the team's official site reports. Analysis: Pryor visited with the Bills both Monday and Tuesday, with the decision to ink him to a contract happening during the latter. The offense is in dire need of playmakers beyond LeSean McCoy, especially in a receiving corps with the underwhelming Kelvin Benjamin and Zay Jones serving as the starters prior to Tuesday's acquisition. Pryor likely passed a physical, proving the health of his groin was sound, but Wednesday's injury report may be the first opportunity for the team to touch on his status. Pryor (groin), who visited with the team Monday, is on his way back to Buffalo on Tuesday, though no deal has been finalized yet, Chris Brown of the Bills' official site reports. Analysis: We imagine that with the Bills in dire need of explosive players on offense, Pryor isn't heading back to Buffalo to get another look at Niagara Falls. Expect the team to make an announcement shortly, and with only Kelvin Benjamin -- who appears not to have been dealt at Tuesday's trade deadline -- and Zay Jones having any meaningful production among Bills wideouts this season (and even that's a stretch), Pryor could quickly develop a role in the offense. Pryor (groin) is visiting with the Bills on Monday, Ian Rapoport of NFL Network reports. Analysis: Pryor was released by the Jets on Oct. 20 amid reports he'd need 2-to-3 weeks to recover from a minor groin tear. He has since informed teams that he's already approaching full strength, potentially paving the way for a Week 9 signing. The Bills have an obvious lack of talent at wide receiver, but there's been no hint of any upside with their passing game. Elsewhere in the AFC East, Jets coach Todd Bowles recently said the team will consider re-signing Pryor. Coach Todd Bowles said the Jets are expected to take a look at Pryor (groin) following Sunday's contest at Chicago, Rich Cimini of ESPN.com reports. Pryor (groin) said he is feeling close to 100 percent and could be ready to play as soon as Sunday, Adam Schefter of ESPN reports. Pryor, who was released by the Jets on Saturday, is expected to be sidelined for about two weeks with a minor groin tear, Rich Cimini of ESPN.com reports. Pryor (groin) was released by the Jets on Saturday, Adam Schefter of ESPN reports. Pryor (groin) is listed as doubtful for Sunday's game against the Vikings, Rich Cimini of ESPN.com reports. 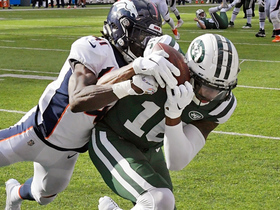 Analysis: With Quincy Enunwa (ankle) sidelined and Pryor almost assuredly set to miss Sunday's game, look for Robby Anderson and Jermaine Kearse to head the Jets' Week 7 wideout corps. One of Charone Peake or Andre Roberts will likely join that duo in three-receiver sets, but neither projects as a high-percentage fantasy option. Pryor (groin) wasn't spotted at Friday's practice, Ethan B. Greenberg of the Jets' official site reports. Analysis: Pryor's production has picked up lately with touchdowns in back-to-back games, but unless he gets in some work behind the scenes Friday, it will likely be tough for him to continue that run this week. The Jets will reveal whether or not Pryor has any chance to play Sunday against the Vikings at the conclusion of Friday's practice. Pryor (groin) wasn't spotted at Thursday's practice, Andy Vasquez of The Bergen Record reports. Pryor (groin) didn't practice Wednesday, Rich Cimini of ESPN.com reports. Analysis: With Pryor hurting and Quincy Enunwa (ankle) slated to miss time, Jermaine Kearse and Robby Anderson profile as the Jets' top healthy wideouts as Sunday's game against the Vikings approaches. With depth at the position a concern, the team is reportedly kicking the tires on both Rishard Matthews and Corey Coleman. Pryor (groin) caught five of six targets for 57 yards and a touchdown during Sunday's 42-34 win over the Colts. Analysis: Pryor gave the Jets the lead late in the first half, catching a 7-yard dart in traffic for his second touchdown in as many weeks. Pryor was looking like he finally getting into rhythm with Sam Darnold but later reportedly pulled his groin while the Jets' top target, Quincy Enunwa, also left the game with an ankle injury. Updates on the injuries were not available shortly after the game, but both obviously warrant keeping an eye on. Pryor suffered a groin injury Sunday against the Colts, Rich Cimini of ESPN.com reports. Analysis: Meanwhile, Quincy Enunwa suffered an ankle injury Sunday, meaning that the Jets' top two healthy wideouts at this stage are Jermaine Kearse and Robby Anderson. Pryor (groin) doesn't have a designation for Sunday's game versus the Colts, Matt Stypulkoski of NJ.com reports. Analysis: After a limited listing Wednesday and an absence Thursday to deal with a family matter, Pryor practiced in full to wrap up Week 6 prep. 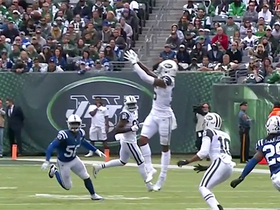 While he'll be available to Sam Darnold on Sunday, Pryor hasn't surpassed three targets in four of five games this season, so he's more or less an afterthought in the Jets' 26th-ranked pass attack. Pryor (groin) rejoined the Jets on Friday, Josina Anderson of ESPN reports. Analysis: Pryor did not practice Thursday while tending to a personal matter, but he is back with the team as of Friday morning. He figures to take part in Friday's practice, and the Jets will reveal his status for Week 6 after the session comes to a close. Pryor (groin) isn't present for Thursday's practice due to a personal matter, Manish Mehta of the New York Daily News reports. Pryor (groin) was a limited practice participant Wednesday, Darryl Slater of NJ.com reports. Analysis: Pryor played through the same injury in Sunday's 34-16 win over the Broncos, hauling in his lone target for a 20-yard touchdown. There doesn't seem to be much opportunity for consistent volume for Pryor so long as Quincy Enunwa, Robby Anderson and Jermaine Kearse all stay healthy. Pryor caught a 20-yard touchdown on his lone target in Sunday's 34-16 win over Denver. Analysis: Pryor wasn't featured much, but he made his lone look count by beautifully plucking the ball out of the air for a 20-yard score. 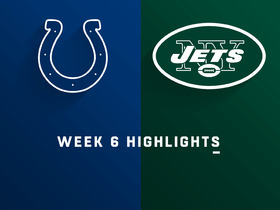 With Robby Anderson reestablishing himself as a viable deep threat thanks to a pair of long touchdown catches in this one, Pryor and Jermaine Kearse should continue to battle for scraps while Quincy Enunwa and Anderson do most of the heavy lifting in New York's receiving corps. Pryor will hope to earn more targets in Week 6 against the Colts. Pryor (groin) was a full practice participant Wednesday, Darryl Slater of NJ.com reports. 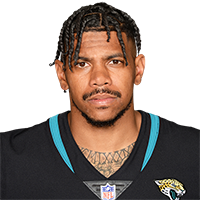 Analysis: Pryor apparently didn't need much time to recover from the groin issue that bothered him in Sunday's 31-12 loss to the Jaguars. The real concern is his minor role as the No. 4 wide receiver in a subpar Jets offense. Pryor was bothered by a sore groin during Sunday's 31-12 loss to Jacksonville, Rich Cimini of ESPN.com reports. Pryor wasn't targeted in Sunday's 31-12 loss to Jacksonville. Analysis: Perhaps the numerous lower-body injuries he battled in practice during the week factored into this poor performance, even though Pryor didn't carry an injury designation on game day. Quincy Enunwa, Robby Anderson and Jermaine Kearse each saw at least five targets, suggesting Pryor has sunk to a distant fourth on the depth chart now that Kearse is healthy. The big-bodied receiver will look to bounce back against the Broncos in Week 5. Pryor (ankle/groin) does not carry an injury designation for Sunday's game against the Jaguars, Rich Cimini of ESPN.com reports. Analysis: Pryor was held to one catch for 25 yards Week 3, but he combined for seven catches for 133 yards over the course of the Jets' first two games, so when the matchup is favorable -- which isn't the case this week -- he profiles as an option in deeper fantasy formats. Pryor (ankle) was a limited participant at Thursday's practice after dealing with groin soreness during the session, Ralph Vacchiano of SportsNet New York reports. Pryor hauled in one of three targets for 25 yards in Thursday's 21-17 loss to the Browns. 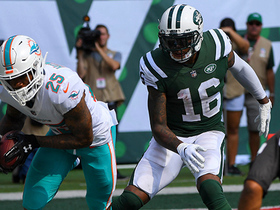 Pryor caught four of eight targets for 84 yards in Sunday's 20-12 loss to Miami. Analysis: Pryor got the crowd into it with a 44-yard catch in the final minute of the first half after Miami had raced out to a 20-0 lead. The big-bodied receiver ultimately finished second on the team to Quincy Enunwa in both catches and targets. While New York's wide receiver pecking order is still being established, Pryor and Robby Anderson appear to be jostling for second behind Enunwa. Pryor caught all three of his targets for 49 yards in Monday's 48-17 win in Week 1 over the Lions. Analysis: Pryor saw a fair bit of action with Jermaine Kearse (abdomen) unavailable, playing 24 of a possible 60 snaps. He finished second on the team in receiving yards, behind Quincy Enunwa's 63 but ahead of Robby Anderson's 41. Both of those other guys got into the end zone, though, suggesting Pryor shouldn't be looked at as more than the team's No. 3 wide receiver, even without Kearse. Pryor is listed as the backup to Robby Anderson on the Jets' unofficial depth chart, but he could see a significant bump in action if Jermaine Kearse (abdomen) isn't available for Sunday's season opener against the Lions. Analysis: Quincy Enunwa is listed as Kearse's direct backup, but it wouldn't be surprising to see him shift mostly to the slot while Pryor picks up most of the reps that would fall to Kearse on the outside. Pryor battled injuries during a disappointing 2017 campaign with the Redskins, but the Jets are hoping he'll return to the form he displayed in 2016, when he topped 1,000 receiving yards as Cleveland's lead receiver. Pryor (ankle) secured both of his targets for 16 yards and a touchdown in the Jets' 22-16 preseason loss to the Giants on Friday. Coach Todd Bowles said Pryor (ankle) will prove himself when he's at full health, Rich Cimini of ESPN.com reports. "He's still coming around. We haven't seen him fully yet," Bowles said. "When he's healthy, he's got a proven track record. We just have to make sure he's healthy when we put him out there and let his natural athletic ability take over." Analysis: There's no doubt that Pryor can hang in the league after he caught 77 passes for 1,007 yards and four touchdowns for the Browns in 2016. He regressed in 2017, however, making 20 receptions for 240 yards and one score with Washington while QB Kirk Cousins threw him the ball. Once he's healthy, Pryor will need to prove himself quickly to earn snaps, given that Robby Anderson, Jermaine Kearse and Quincy Enunwa all are back with the Jets. Pryor (ankle/hip) will not play in Thursday's preseason game against Washington, Manish Mehta of the New York Daily News reports. Analysis: Pryor relayed Monday that he broke his ankle in May, which further explains his limitations at practice through camp thus far. Moreover, the wideout has had to contend with some hip issues as he gets accustomed to amping up his running. Pryor aims to play at some point in preseason, but for now he'll continue to ease back into things with a controlled snap count at practice. Pryor (foot/ankle) is participating in team drills Wednesday for the first time since signing with the Jets, Rich Cimini of ESPN.com reports. Pryor (ankle) started training camp Friday working off to the side with the Jets' training staff, Ralph Vacchiano of SportsNet New York reports. Pryor (ankle) wasn't wearing a walking boot at Wednesday's practice, but he didn't participate in the session, Calvin Watkins of Newsday reports. Analysis: Pryor is still rehabbing from a minor foot procedure he required earlier in the offseason, but he's expected to return during training camp. His presence without the boot supports that notion, especially with more than a month left before training camp begins. Pryor isn't assured of a significant role, as the Jets' wideout depth chart also includes Robby Anderson, Jermaine Kearse, Quincy Enunwa (neck), Chad Hansen and ArDarius Stewart. Pryor (ankle) underwent a minor foot procedure but is expected to be ready for the start of training camp, Ian Rapoport of NFL Network reports. Analysis: Pryor has been sidelined for all of OTAs after suffering another foot/ankle injury during the offseason, but it looks like after having a cleanup procedure the newest Jets wide receiver will be ready for the start of the team's training camp, barring any setbacks. Pyror will be fighting with the likes of Jermaine Kearse and Quincy Enunwa for a spot near the top of New York's wide receiver depth chart this season. Pryor suffered another ankle injury during the offseason and is not participating in OTAs, Manish Mehta of the New York Daily News reports. Pryor's (ankle) one-year deal with the Jets is for $4.5 million and includes $2 million guaranteed, Tom Pelissero of NFL.com reports. Pryor (ankle) reached terms on a contract with the Jets, ESPN.com's Rich Cimini reports. Pryor (ankle) is closing in on a deal with the Jets, Ian Rapoport of NFL Network reports. Pryor (ankle) is expected to sign with either the Jets or Seahawks, Mary Kay Cabot of Cleveland.com reports. Pryor (ankle) will visit the Seahawks on Sunday, Ian Rapoport of NFL Network reports. Pryor (ankle) recorded 20 receptions on 37 targets for 240 yards and one touchdown over nine games for the Redskins in 2017. The Redskins placed Pryor (ankle) on injured reserve Tuesday, Stephen Czarda of the Redskins' official site reports. Pryor (ankle) will be placed on injured reserve, John Keim of ESPN.com reports. Pryor will undergo arthroscopic surgery on his injured ankle Monday, Ian Rapoport of NFL Network reports. Pryor (foot/ankle) admitted that he's worried about his status for the rest of the season, ESPN.com's John Keim reports. "I'm concerned," said Pryor. "I don't want to do surgery. [Dr. Robert Anderson] said the stuff he saw in there, he couldn't believe I was still playing on it. ... Hopefully they don't put me on [injured reserve] and I can come back and help them do something." Pryor (ankle) has been ruled out for Sunday's game in New Orleans, John Keim of ESPN.com reports. Pryor didn't practice Thursday due to an ankle injury, Master Tesfatsion of The Washington Post reports. Analysis: Although the Redskins have regularly posted jam-packed injury reports this season, Pryor didn't make an appearance until Thursday. It's unclear when he injured his ankle, but his sudden listing should be cause for concern. Friday's injury report will relay Pryor's odds to play Sunday at New Orleans. Pryor (undisclosed) wasn't present at the portion of Wednesday's practice open to the media, John Keim of ESPN.com reports. Analysis: The impetus for Pryor's absence is unknown, but the Redskins can be expected to clarify whether an injury, personal issue or some other concern is to blame. After receiving at least four targets in each of the first six games of the season, he's experienced only four total across the last three outings, displaying his waning relevance in the league's ninth-ranked passing attack. Pryor failed to record a reception in his 28 offensive snaps in Sunday's loss to the Vikings. Analysis: Pryor continues to see decreased offensive reps, as Sunday marked the second time in the last three games he was held without a reception. It seems as if the Redskins are more than content moving forward with Jamison Crowder and Josh Doctson as the two featured wideouts in Kirk Cousins' arsenal. Pryor hauled in two of three targets for 17 yards in Sunday's win over the Seahawks. Pryor said that his reduced snap counts in the Redskins' last two games have allowed him to recover from two bad bruises on his right foot, John Keim of ESPN.com reports. "It's just not fun. It feels good that I was able to rest it," Pryor said. "I'm dealing with that, fighting that and continue to not put wear and tear on it, so at the end of the day, [the reduced workload] helped me." New York Jets wide receiver Terrelle Pryor leaps to catch an impressive pass from quarterback Sam Darnold for a 22-yard gain. 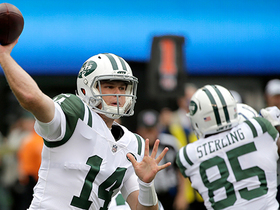 New York Jets quarterback Sam Darnold throws an impressive 7-yard touchdown pass to wide receiver Terrelle Pryor for the score. 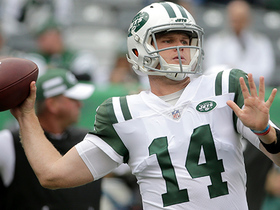 New York Jets quarterback Sam Darnold finds wide receiver Terrelle Pryor for a 19-yard gain. 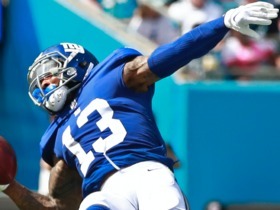 Pass catchers continued to thrill and excite in Week 5 of the NFL season. Here is a look at the best grabs from the week. 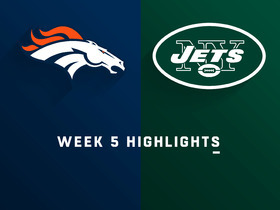 New York Jets wide receiver Terrelle Pryor makes an impressive 20-yard touchdown catch with one hand against the Denver Broncos. 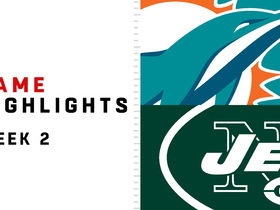 Miami Dolphins cornerback Xavien Howard intercepts pass from New York Jets rookie quarterback Sam Darnold in the end zone. 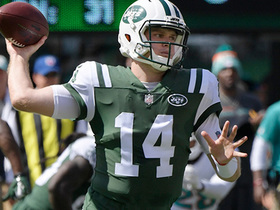 New York Jets rookie quarterback Sam Darnold connects with wide receiver Terrelle Pryor for a solid 44-yard gain.